How do I choose my Pan Types or Shelf Type? How do FN/CN Liners secure to the cage? What is the "Absorbent Padding" upgrade? How do I get the most out of my Cage Liners? What is the "Cutout Position"? What do you mean by "Fixed Ramps"? How do Martin's Liners secure to the cage? How do Rat Manor Liners secure to the cage? How do I choose my C&C size? What are C&C Liners made of? How do I choose my Pan Types? We offer the option to mix & match Pan types! Choose between the Full Bottom Pan or Full Middle Pan w/Ramp Cutout. We also offer a "Multi-Use Pan" which can be used for either the bottom or middle full pan. How do I choose my Shelf Type? Our shelf liners have been redesigned to work with both new and old style shelves. The pan liners are grommeted and attach to the cage bars with shower curtain hooks, which are included with your purchase. Our new shelf liner design is interchangeable with both new and old style shelves. Simply lift the entire shelf out of the cage, place the elastic strips around the two outer shelf corners and then slip the smaller elastic loops around the shelf mounting hooks (where the shelf attaches to the cage frame). Then place the shelf back in the cage and enjoy. Due to the nature of Martin's cages, it is possible to assemble the large shelf ramp cutout in various positions. In the event that the fabric you choose is a directional print, it is neccesary to know exactly where your ramp cutout is in relation to the front of your cage to ensure that your fabric print is facing the right direction. A diagram is available on each Martin's product page to guide you through selecting the location of your cutout. During assembly, most people choose to leave their ramps attached only at the top of the ramp, allowing for easy lifting of the ramps when placing shelf liners down. Some, however, have secured their ramp to the larger middle shelf as well, which will prevent them from being able to place a standard middle pan liner down. You will need to be able to lift your ramps up in order to lay our middle shelf liner in place. The large pan liner is oversized, which allows the cage itself to hold the liner in place. 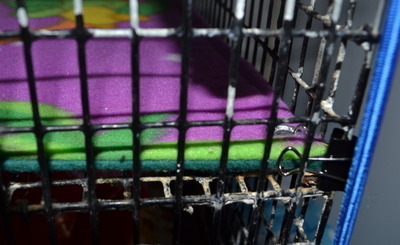 The large shelf with cutout & smaller shelves are grommeted to allow you to secure them to the cage, though most customers choose to secure Rat Manor liners to the cage with binder clips (not included). What are your C&C Liners made of? Our "Standard" C&C liners are made up of two layers of fleece with a layer of absorbent UHaul padding in the middle (a highly absorbent material made from recycled denim). Other options include "Double Absorbency" (2 layers of UHaul padding), or "Fleece Only" for those who want to place their own absorbent materials under a fleece only liner. All fabric is prewashed with hot water & heat dried on high to ensure minimal shrinkage & color bleed. C&C liners are not commonly secured with any attachments. They are simply placed in the cage and weighed down with other cage items, if required. "Absorbent Padding" allows you to add a layer of UHaul Furniture Padding in the middle of your liners (C&C liners are already made standard with UHaul padding). UHaul Furniture Padding is made from recycled denim and is highly absorbent and very plush. Liners made with UHaul padding will wick moisture away from little toes more efficiently, but are also more prone to shrinkage and take longer to dry. All fabrics have been washed & dried on high heat to ensure minimal shrinkage & color bleed, but to get the most out of your cage liners, we recommend washing & drying a few times prior to use. Fleece takes multiple washings before it will wick moisture away properly. Washing & Drying Temps: Liners may initially arrive oversized to account for future shrinkage. To shrink oversized liners, wash/dry with medium-high temperature. Once the desired fit is achieved, wash/dry with low-medium temperature when possible. Fleece (and Uhaul especially) will shrink over time, so it is better to leave liners slightly oversized. Wash bedding with unscented detergent to protect small noses. For additional odor removal, vinegar or baking soda may be used. Washing bedding promptly (rather than leaving dirty bedding to sit for a few days) will also aid in keeping liners smelling fresh. Do not use fabric softeners or dryer sheets. They act as barriers that will actually cause the fleece to repel moisture instead of allowing it to wick through. The fragrance can also be very irritating to tiny noses. Please remember that these little ones have no option to get away from these scents and rodents are very prone to respiratory issues. Use a small broom/dustpan or hand vac to spot clean any poos daily. When ready to clean, shake liners off outside to remove any debris that might clog your washer & dryer. You can also place your liners & hammocks in a zippered washbag when washing. though this usually is not necessary. Always inspect liners & hammocks for holes & loose threads as these can pose choking or entanglement hazards. Trim any loose threads, and make sure that any holes present are either small enough or big enough for your companions to not get trapped in. When in doubt, throw it out. No toy or bedding is worth the life of your furry companion.